Outfittery has taken on the problem of "men and fashion": men who want to get new clothes need to get on their way and go to a clothing store. Once there, you have to find your way around first and find the necessary clothes. Then it goes into the dressing room to try on these clothes. Most of the time, this process has to be repeated two or three times in order to find suitable items. What a pain! At least for men. In order to meet your style, you can also involve the staff in the process. Another pain! For most men. Then you have to pay and carry the things home. So there are quite a few "jobs" to do until you can find new and matching clothes in the closet at home and put them on, in order to present themselves to the second half of the earth's population. 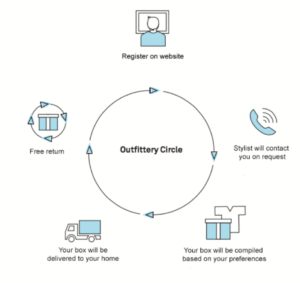 The startup Outfittery has taken on this series of jobs: once you have registered and logged into their website, a stylist will contact you by phone to get a picture of the man who is shopping. Then she puts together a box with an outfit and sends it by mail. The man does not have to leave the house, nor choose clothes or try them on. The box with the hopefully stylish outfit will be conveniently delivered to your home and can be returned free of charge if you do not like it. So Outfittery takes on jobs which are unpopular for many of their peers and even cause "pain" for some. Learn more about the fourth module "Jobs" of the Startup Navigator in the handbook.